As I’m sure many (if not most) music fans will agree, five-band sets can be painful. The set-up time in between sets combined with the sheer amount of time spent standing in a venue is exhausting. However, the Phangs show was worth the wait. Fashion Week played an acoustic set as the first opener, with two members instead of their usual three. The duo, Tyler and Jason, held the audience captive with well-blended, chill music. Michigander, the second opener, was comprised of only Jason Singer. With an effortless talent for guitar and melancholy lyrics, he was a popular act and had many members of the crowd singing along. The third opener was Moon, a new group formed in Columbus. Made up of five members, it was the first full band of the night and stood in stark contrast to the softer acoustic openers. The sometimes-dreamy, sometimes-heavier sound was polished for their first show. Ex-Nihilo was the last opener before Phangs and the most energetic of the four. The lead singer, Austin, had the stage presence of an experienced performer and often bounced into the crowd to sing. The energy was insane; Austin’s behavior combined with the overall catchy quality of the music had everyone clapping along, and it was clear that Ex-Nihilo’s intensity yearned for a bigger crowd. Phangs, the main act, had some technical difficulties before their set (an understatement; the band spent close to 45 minutes setting up). Frontman Jake Germany apologized several times to the crowd, explaining that they wanted their show to be as good as possible. They proved to be worth the wait, however. While they played with tracks, it was clear that all three musicians were incredibly talented. The mere fact that they were so concerned with the audio proves their dedication; there wasn’t a massive crowd, yet they still strove to put on the best show possible. 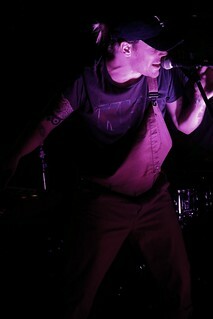 All in all, it was an excellent night, made better only by watching Jake Germany thrash around in khaki overalls. *Correction: a previous version of this post stated incorrectly that the Fashion Week duo was Andrew and Jason, not Tyler and Jason.